Sometimes I have a reason for a project (I personally want one or I think I can sell it). Other times I just want to try out something new or challenge myself. These bags are more of the second. There really isn't any demand for them, but I thought it would be fun to figure out a bag pattern on my own. 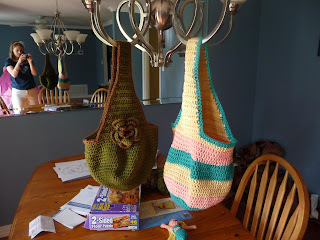 I made the first two free hand (meaning I didn't have a pattern and made it up as I went) and then sat down over the last couple of days to make a third, just so I'd have some "in progress" photos for this blog. The first one I made (the yellow, pink, and teal one), I've decided to use as a back up purse. It has the advantage of being able to fold up small enough to slip into a side pocket of my diaper bag so if I get to a store I don't want to lug the full baby kit into, I can whip out the tote, throw in my wallet, cell phone, and car keys (and maybe a spare diaper) and I'm good to go. 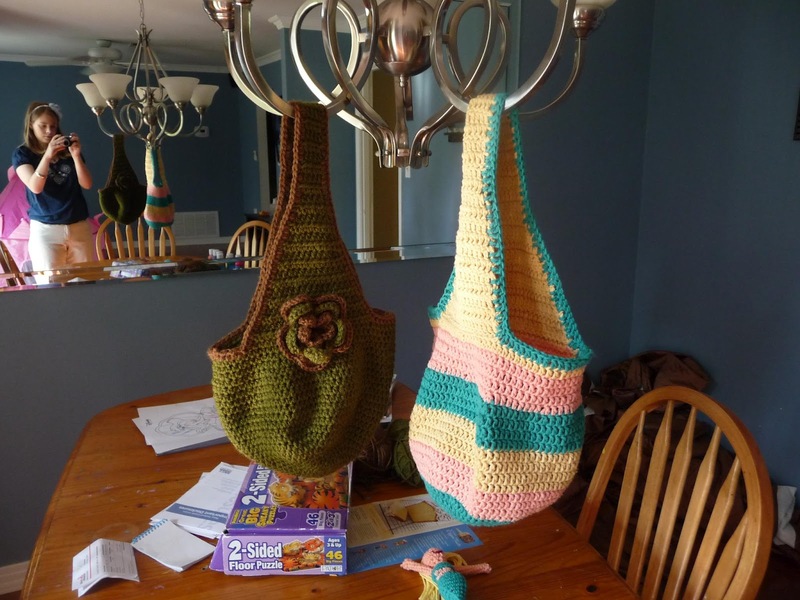 Unfortunately, yarn is stretchy and small objects tend to make their way through the weave, so if I were to market these as "purses" they'd probably need a liner and something to close up the top so your possessions aren't falling out all the time. The pattern, if expanded upon, could make for a decent book bag. It is a fun, easy project to make. It's worked in a round with half-double crochet (hdc). You can make it with any sort of yarn you'd like and in any color you'd like, with any hook size you want, and it is a good basic project. I'll throw in some tips for customizing the size of your bag along the way. Ch 2, 6 hdc in the second chain from hook. I'm basically just increasing six stitches (evenly spaced) every round. If you want a smaller or larger bag than the one this pattern makes, just adjust the amount of increase rounds you use. I increased until it measured 108 stitches around (6x18). I know increasing evenly gave me a bit of a head ache before I got the knack of counting my stitches early on, so I'm going to list every row even though I'm tempted to just tell you to "do the math." If you would like your purse to be deeper, add more even rounds at this point. If not, continue as directed. Again if you want a larger purse you might consider increasing the even rounds here. The amount of rows worked here determines the length of the strap. Please adjust it to the length you want. HR61-2hdc in the first stitch, hdc in the remaining stitches across. Carefully line the handle up with the opposite side of the bag and slip stitch it in place. Fasten off and weave under ends. The bag with the first handle row. A couple rows into the handle. The first rows have some decreases to make it a little more gradual. You could make this handle wider or narrower if you want. Also the length of it is up to you. The handle starts to take shape. When you reach the desired length, do the increase rounds, then . . . Figure out where it needs to attach on the opposite side of the bag. Folding the bag in half is a good way to make sure the strap is centered on the bag. Then. . .
Slip stitch it in place. And you have a bag! Matt says the 70's called and want their color scheme back. If you have any questions, comments, or have tried the pattern and think I may have left off a step, please comment below. As always you can follow me on Facebook, Etsy, or Pinterest.